One of the highlights for Muhammad Fauzy Bin Hasbollah’s (or Fauzy) Overseas Immersion Programme (OIP) was the experience of staying abroad and managing his time and finances, all while studying. All of TUM Asia’s Bachelor students have the opportunity to head to Munich, Germany, during their final semester to complete their Bachelor Thesis in the university’s home campus. We catch up with Fauzy on his experience in Europe. Fauzy (center) had the opportunity to travel around Europe on weekends, during his OIP in Munich, Germany. Fauzy: Phenomenal. The experience of staying abroad, managing finances and time independently, while squeezing short overseas trips over the weekends were exceptionally amazing. Furthermore, we learned to adapt to the cold weather conditions and enjoy the different weather seasons. How is your experience with the German language, as a non-German speaker? Fauzy: ActuallyI did pick up German via Youtube videos to learn the basics, which made it easier to communicate with the locals. Nevertheless, getting around Munich was not much of a problem with the availability of the Internet. 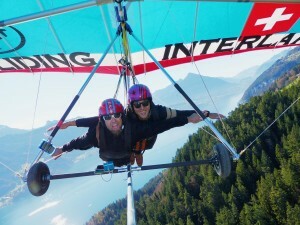 Fauzy took the chance to go hang-gliding, among other activities. At TUM Asia, each student chooses a topic of their interest for their Bachelor thesis. What is your thesis about? Fauzy: My thesis topic allows new equipment and processing methods to be developed for the industry. I was able to research on that through the study of fluid dynamics in a rotor-stator spinning disk reactor by utilizing the Computational Fluid Dynamics (CFD) simulation. Any interesting experience that you encountered during your time overseas? Fauzy: Hmm, the most interesting experience I encountered was the mutual trust that existed between the transport providers and the public commuters. There are no gates or barriers to the train stations as you would typically find in Singapore. Anyone can get on and off the train without a ticket! Now that you are coming to the end of your education journey, what thoughts do you have looking back at your experience? Fauzy: Every journey has its own painful moments as well as wonderful memories. I must say that I have pretty much enjoyed my university education and am proud to have completed it. You came from a Polytechnic background. How would you compare your Polytechnic experience to your university experience? One last word – what advice would you give to those considering a German university degree? Fauzy: Studying in an accelerated education programme is challenging, but it can be a painless journey. Although you might face difficulties along the way, persevere, study hard and smart. Play hard and enjoy yourself during your free time! It’s definitely possible, and the trip to Germany is a great ending to university!